This week’s Photohunt theme is vertical. I went out for a walk in a local park this week and it came to me what I would post – trees! I could go with tall vertical Redwoods but I decided to do something a little bit different. 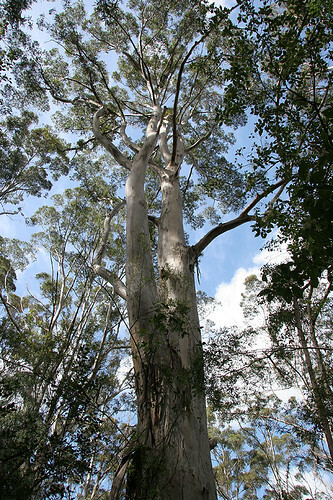 Still tall and very vertical – Tingle Eucalyptus – Eucalyptus jacksonii – from SW Australia. 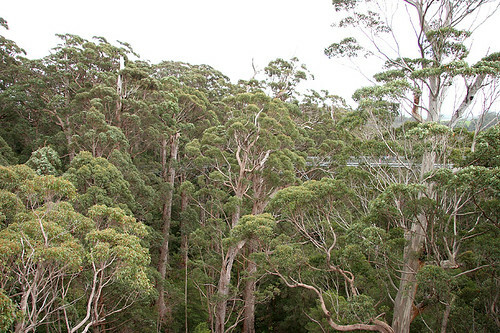 What is really cool about this area is there is a tree top walk which lets you get up among the tree tops! You can walk along the vertical tops of the trees. There are also options to climb vertically up the tall trees but we didn’t have nerve to try that. 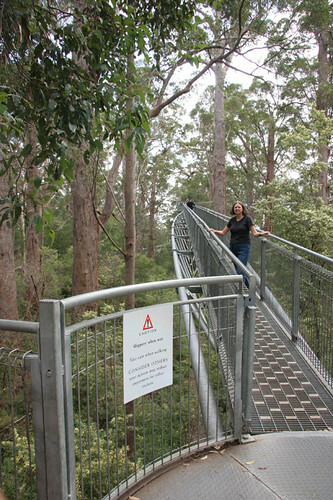 Here are some shots of the tree top walk at Valley of the Giants outside of Denmark in South Australia. Addendum: A couple of people wondered about the walk. Yes, we did actually do it. It was a little scary at first but I got used to it. It didn’t sway much so that was good. The metal felt very secure. Here are two pictures of us on the walkway. WOW, that tree-top-walk is so interesting. Seeing the forest at canopy level, how exciting! Oh my gosh, you are braver than me if you did that tree top walk! Those are huge! 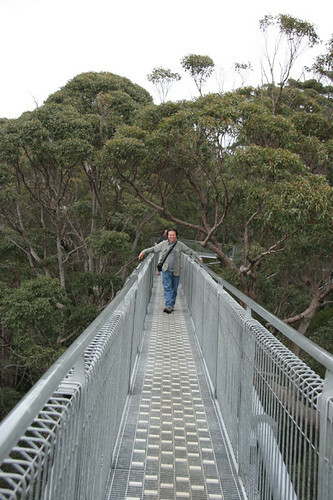 The shot showing the bridge/walkway almongst the treetops really puts things into perspective. Best part of that first photo is you looking up! Great shots! Hi Marta, these are beautiful photos and a wonderful choice for this week’s theme. The tree top walk is amazing. The trees and the sceneray are beautiful. Thanks so much for sharing. Hope you have a wonderful weekend. 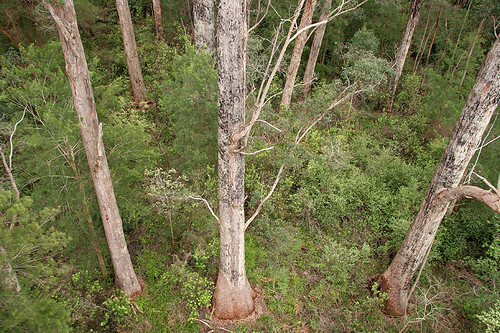 I’ve been among the redwoods in Northern California, but those Australian trees are enormous. I really like the huge eucalyptus, the size is incredible and scary at the same time since they are prone to always shedding their limbs. Well done interpretation! thanks for sharing with us….have a great weekend. Oh my word! That is soooo cool! Great pics for the theme! Marta, Oh may, those are huge trees, when I see you next to them in the first picture. Did you really take the tree top walk? I have such a fear of heights, I could never do that, but I am sure the view from up there is staggering. Great choice for this week!! Happy weekend. I added two pictures of what the walkway actually looks like. Wow, what an incredible place. I would have been a little bit queasy doing that walk. Beautiful photos. 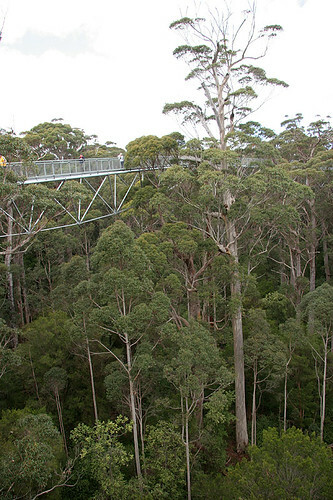 The tree top walk looks like so much fun. The photographs are all stunning and perfect for the theme. Happy weekend. Wow and Wow.. it would be so nice to take that walk.. wonderful take on today’s theme. Thanks for coming by to see me! Whoah! Those gave me vertigo. You seem to have a theme in your take on the theme. Beautiful trees. I like your “angle” on the vertical theme. love all your vertical shots. great choice for the theme. 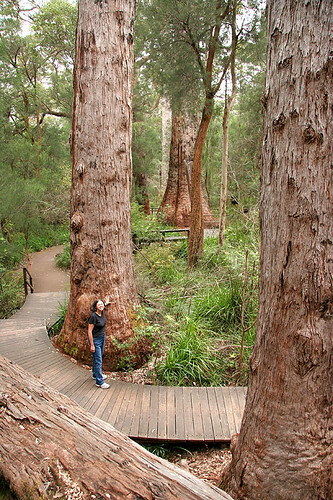 Amazing big trees! 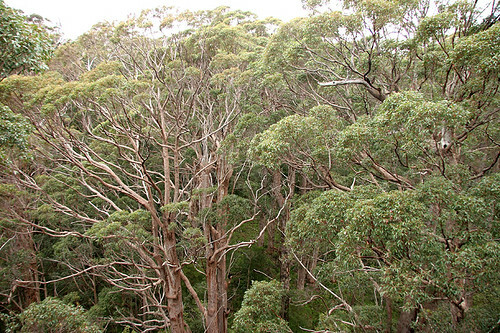 I love eucalyptus trees and had a couple in our previous home. They are messy but they smell so good. A trip top walk!? I’m so glad I know so many people that are not afraid of heights so that I can live vicariously through their adventures way up high. Wow the Redwoods are enourmous! I love that walkway. What a way to see the trees from a different perspective! Very coool! I would love to take that walk. I can only imagine the view from up there. Amazing shots, Marta. Walking among the tree tops must have been a fantastic experience! Catching up on posts. Good choices for the theme…very very VERTICAL indeed. You are so lucky to live near something like this. I’d love to go on that tree top walk. Late in commenting… Very cool! I love the first photo – it really shows just how tall those trees are. Must have been amazing to be there. I bet it smelled great also. I love the smell of eucalyptus trees. Good for you to do the tree top walk. Looks like fun!